Good afternoon ladies and gents! 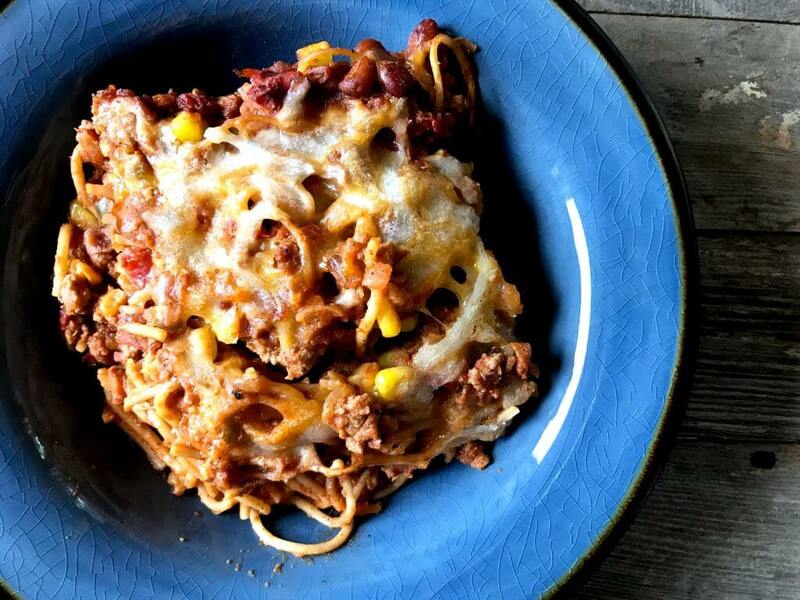 This Chili Cheese Spaghetti Bake is absolutely to die for. 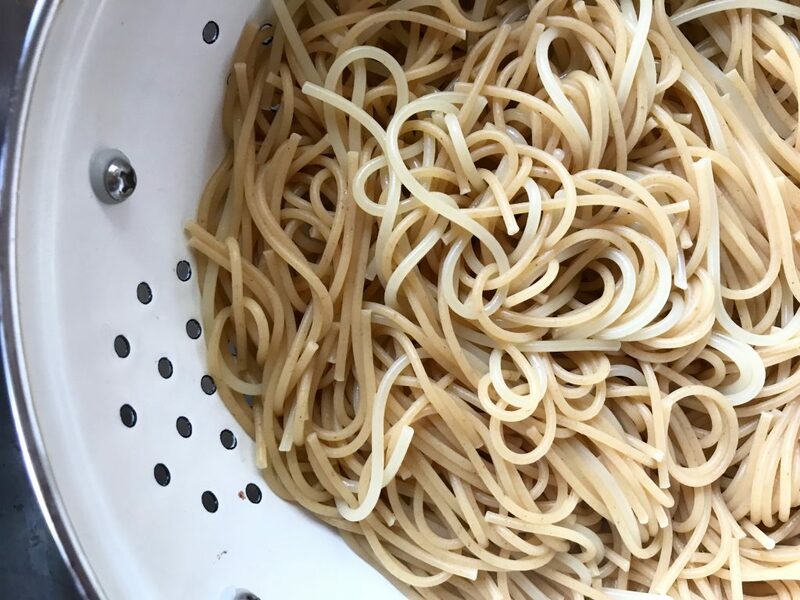 It’s full of flavor and pasta and so much deliciousness that you’re just not going to know what to do with yourselves. First off, I’m sorry I didn’t have a recipe for ya last week. We decided to dive head first into potty training. I didn’t really realize how involved it would be… (Hi, my name is Star and I’m a first time mama!) I really wasn’t prepared and potty training practically beat me to a pulp. I figured I had minnie mouse stickers and minnie mouse potty and we were all set! Reality check, there were so many tears for both Pepper and I. I decided after the third day that I didn’t think she was ready quite yet so we will be visiting it again in a few months. I do feel like I kind of failed as a mom, but at the same time, I think that I know what’s best and for now, what’s best is to take a little break. I think potty training might quickly become my least favorite thing about parenting. I don’t dislike too many things when it comes to being a mama… well except for the whole forgetting to take care of myself sometimes part. haha. BUT, I am hoping that when she shows a few signs that she’s ready that it may come easier for the both of our sakes because man, that was just NOT my cup of tea. 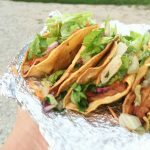 Now for some food talk, in this brand spankin’ new post you are going to see two worlds collide. 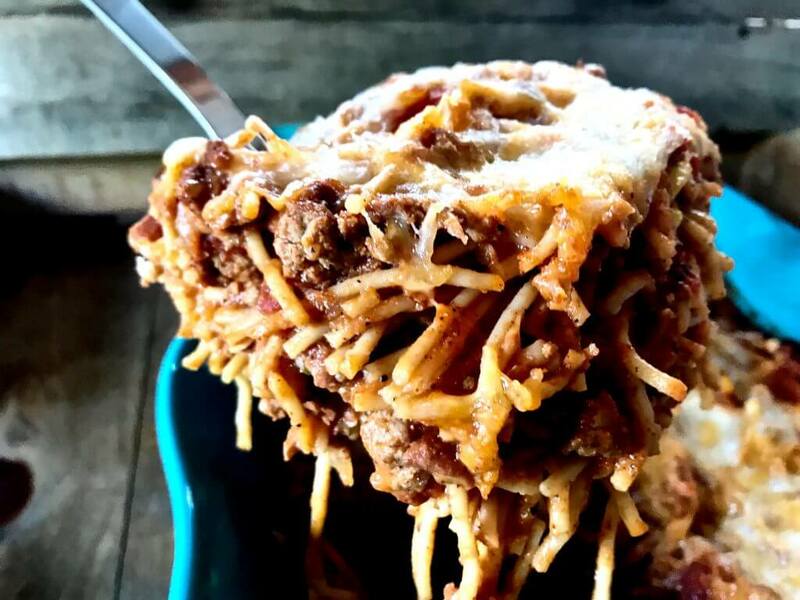 The world of chili and the world of spaghetti. I didn’t even know this world existed until Eric and I started dating each other 700 years ago. (Ha! Just Kidding… it only feels like 500 years. Kidding!) It’s been almost 9 mostly wonderful, sometimes terrible, usually hilarious, and kind of perfect years together now. When we first started dating Eric basically lived off of chili, pizza, fried chicken from a local spot, and canned minestrone soup. As you can imagine, his world got a little rocked when I declared to him that the oven has many more uses other than to just store some random pans in and also that take out pizza from Bianchi’s was in fact not an actual food group. Now, I’m sure you’re wondering why I am going on about Eric and the food he ate before he knew I had existed. Here’s the thing, Eric taught me everything I now know about chili. It’s the only thing he “says” he knows how to make. He’s actually a two time chili cook off champ! (I’m so proud!) He has also taught me about Chili Spaghetti. 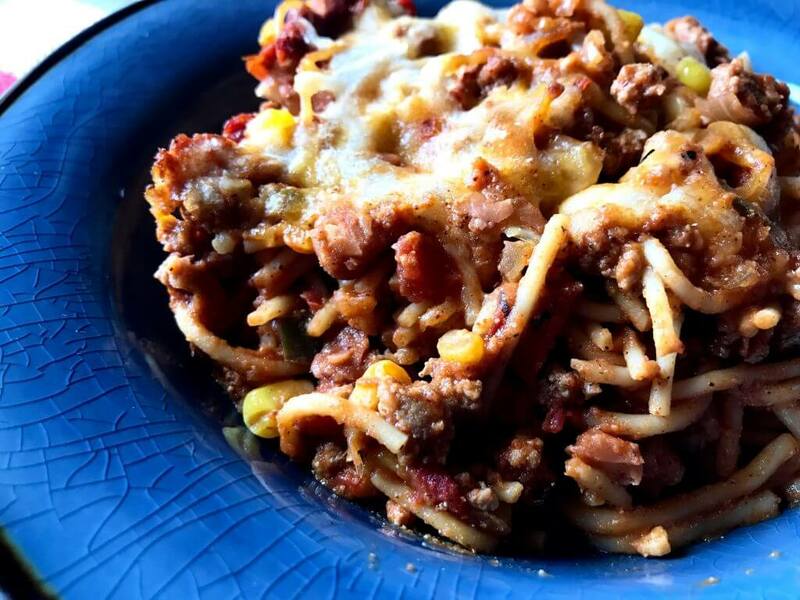 Now, up until about a year ago I didn’t realize Chili and Spaghetti together was actually a thing that normal people enjoyed from time to time. I just thought it was another Ericism. Truth is, I never really thoroughly enjoyed a bowl of chili until about two weeks ago. 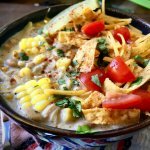 My entire life I was convinced that I hated chili, that I hated beans, that I never wanted anything to do with either of them. EVER. I take it back. right here, right now. You see folks, it turns out I just really, really, really hate kidney beans and since MOST chili is made with those terrible littles things I made the decision very early in life that I hated chili. One beautiful fall-like afternoon a few weeks ago, I decided to make chili all by myself and just use the beans we had on hand. Black beans and pinto beans both of which I actually kind of enjoy mashed up in a lot of Mexican dishes. I figured I’d give it a try and if I didn’t like it Eric would eat it and life would still go on and I’d still hate chili and the world would keep on’a turnin’. Ya’ll… I like chili and I apparently even like some of the dang beans in it. Okay, let’s get in the kitchen and make some delicious food. 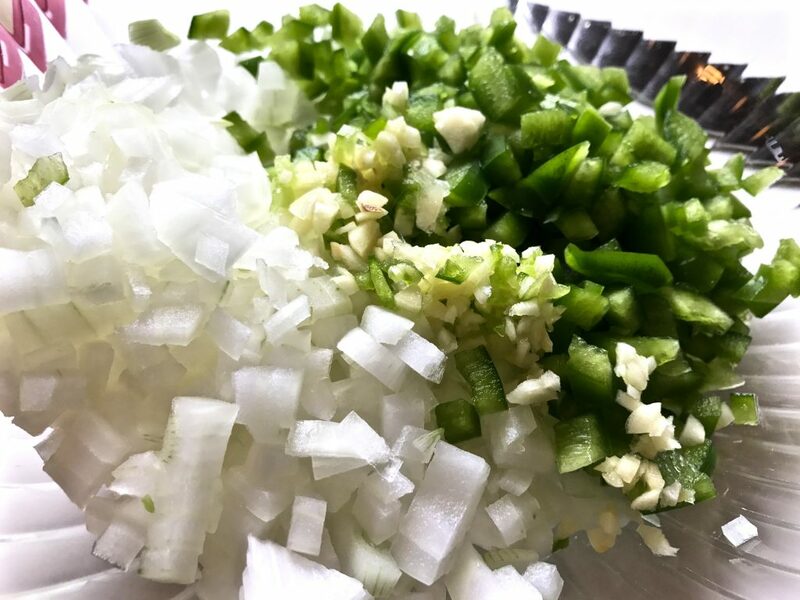 First up, chop up a green bell pepper, a sweet onion, and a few cloves of garlic. You can totally use a red bell pepper too! I wanted to, but I only had one lonely green pepper on hand. 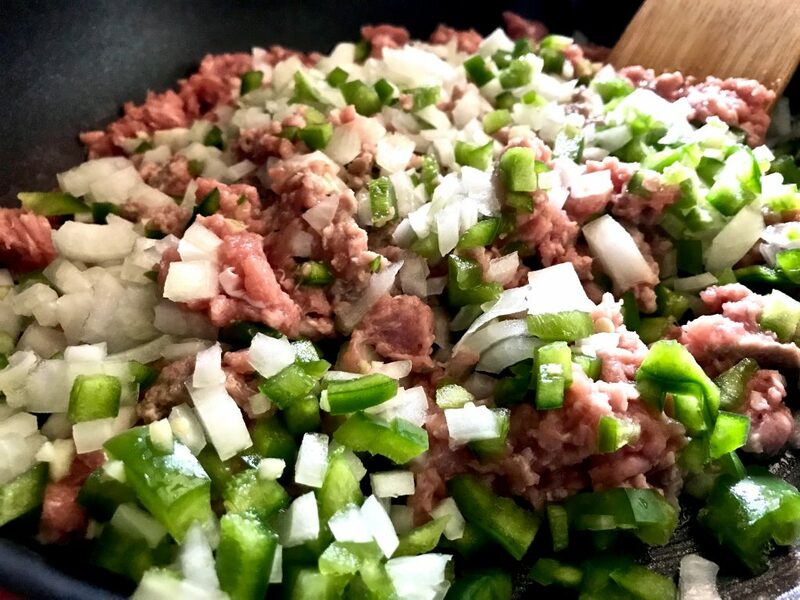 Throw a pound of lean ground turkey in a large pipin’ hot skillet, sprinkle with a bit of kosher salt, and break it up with a spatula. When the turkey is mostly broken up add the chopped green pepper, onion, and garlic to the pan. Continue to cook together over medium-high until the meat is cooked through and veggies are softened. Fill up a pot with water and don’t forget to salt that water! 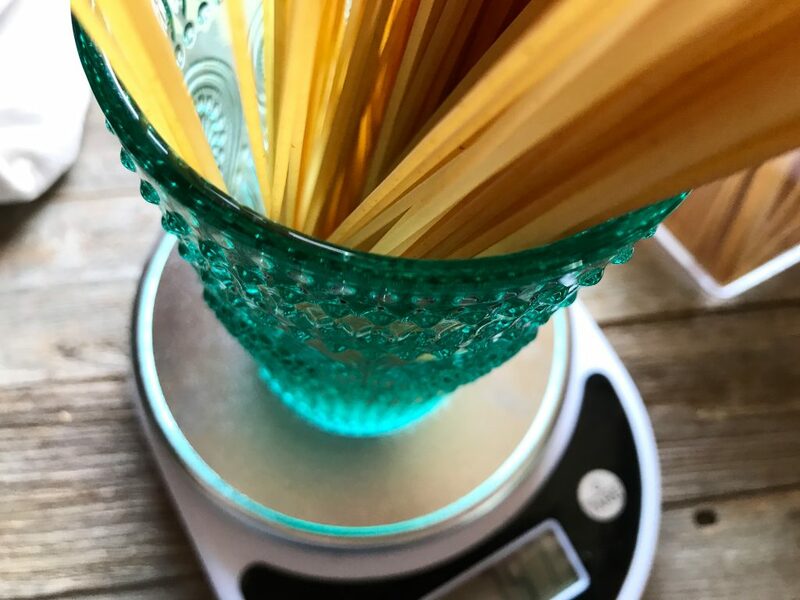 Add 6 oz of dry spaghetti noodles to water when it’s boiling and cook according to package directions. Also, break up those noodles into a few pieces before thrown’m into the boiling water. It’ll make stirring it all together a bit easier. Now let’s get back to that delicious skillet of goods you’ve got on the stove. 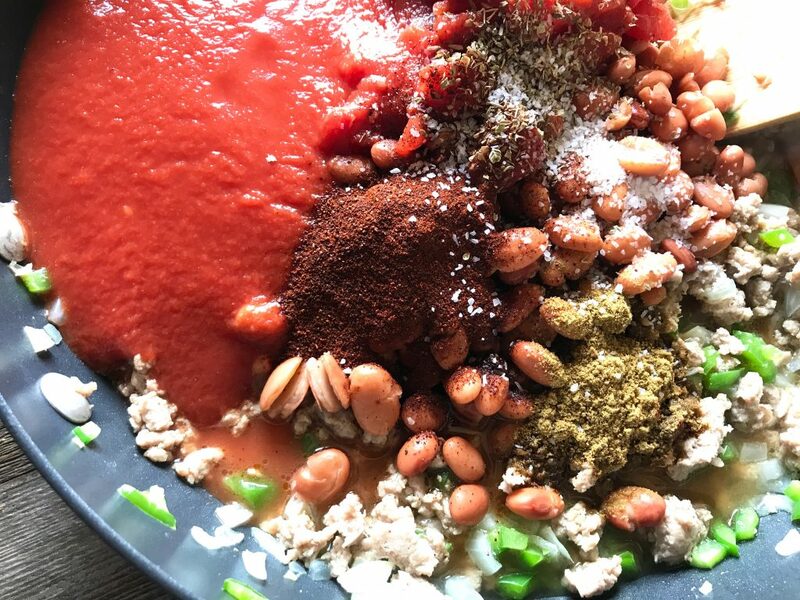 Add your drained can o’ beans, tomato sauce, diced tomatoes, oregano, cumin, chili powder, kosher salt, Worcestershire sauce, and don’t forget a dash or two, or five of your favorite hot sauce! 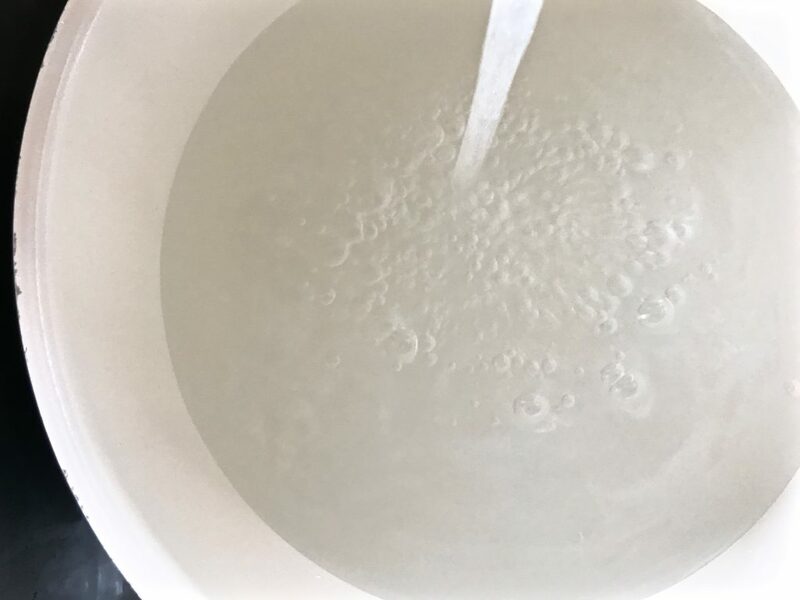 Stir it all up, bring to a quick boil and then reduce the heat to low, and continue to cook until everything is ready to go into the casserole dish. Oh! and make sure to add some corn because it’s really delicious. 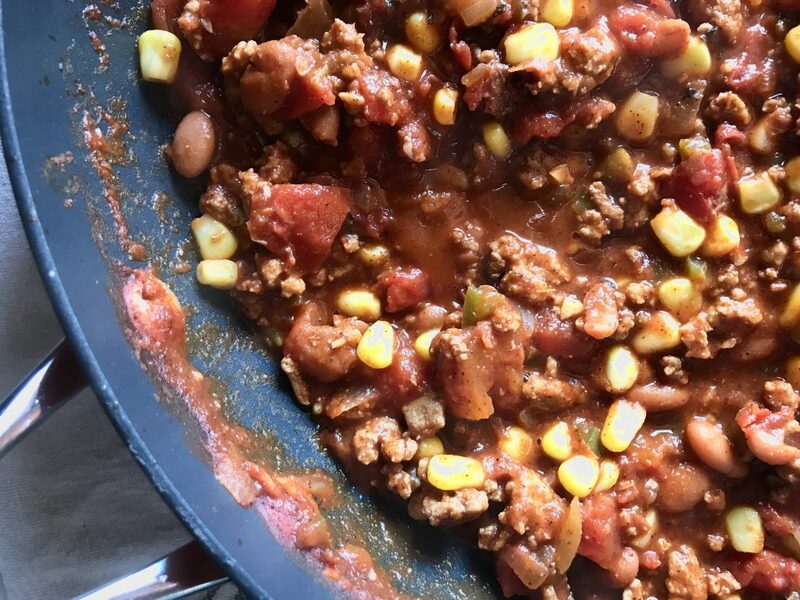 Eric has always added sweet corn to his chili and I think it adds a perfect amount of sweet to it. And pour’m into a lightly sprayed (with cooking spray) 9×13 casserole dish and spread’m around evenly. Layer the chili mixture on top of the noodles. Then, throw some cheese on top! Because life is meant to be enjoyed. Cover it up with some tin foil, place dish into a preheated 350 degree oven, and bake for about 30 minutes. And then you’ll have somethin’ like this when ya take it outa the oven. In Eric’s words, I literally “tortured” him because I told him he could not touch this until I got a few decent pictures for this here blog. I made him stand to the side and hold this spatula full Chili Cheese Spaghetti until I got a few decent photos. He was NOT happy that I wouldn’t just let him grab a piece with his hands. haha! I am the worst, I know. 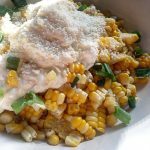 It’s a messy little pile of creamy, cheesy, flavorful goodness and I love it a whole bunch! I know I probably should have wiped the side of my plate clean. Whoops! Real life comin’ atcha. One more, because yum. You won’t believe that this is lightened up. You just won’t. You’ll be commenting and emailing me telling me I’ve betrayed you. Eric even asked if this was going to be the recipe that was meant for the blog because he stated that it tasted like a million calories. I think that’s a compliment? I’ll take it as a compliment. It’s not a million calories and it’s just GOOD. I hope ya make this! and I really hope ya love it! It’s just perfect for the fall weather that is quickly approaching. 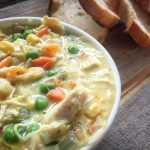 It’s comfort food at it’s best and it’s lightened up just enough for y’all to enjoy any day of the week. If you have a husband, boyfriend, or anything of the sort hide yo leftovers. Trust me. P.S. I know this list of ingredients is like a mile and a half long, but I promise you that this is a VERY easy dish to throw together. P.P.S. 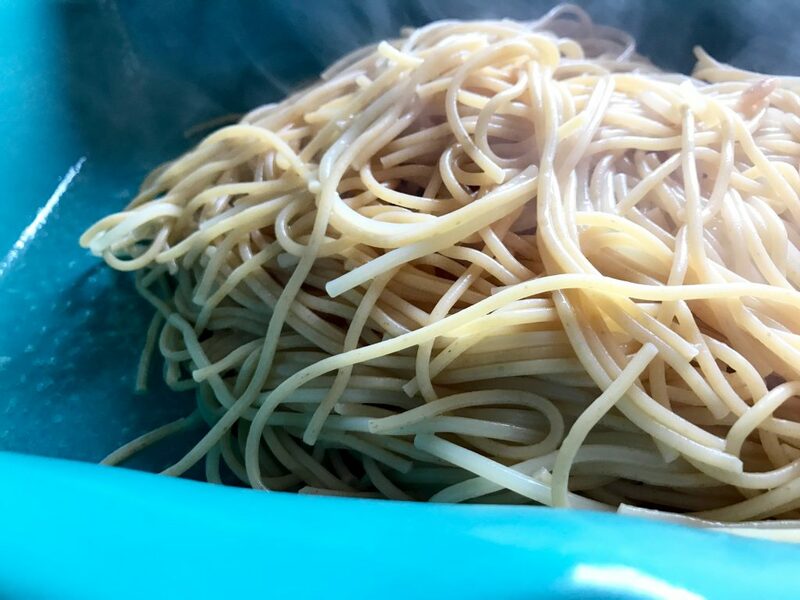 Apparently my brain has completely forgotten how to spell the word “spaghetti” While I was editing this post I had to correct it from “spaggetti” to “spaghetti” about 14 times so if you see it misspelled please know that I tried my best to correct it all, but my brain just isn’t cooperating with me today. I looked at the word spaghetti too long and was convinced that everyone has been spelling it wrong all these years and every other word looked like it was misspelled. Am I the only one who this happens to? 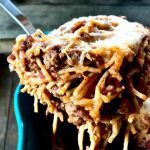 A delightfully delicious chili piled onto spaghetti noodles, topped with cheese, and then baked in the oven to create a super easy and delicious dinner! Preheat oven to 350 degrees. 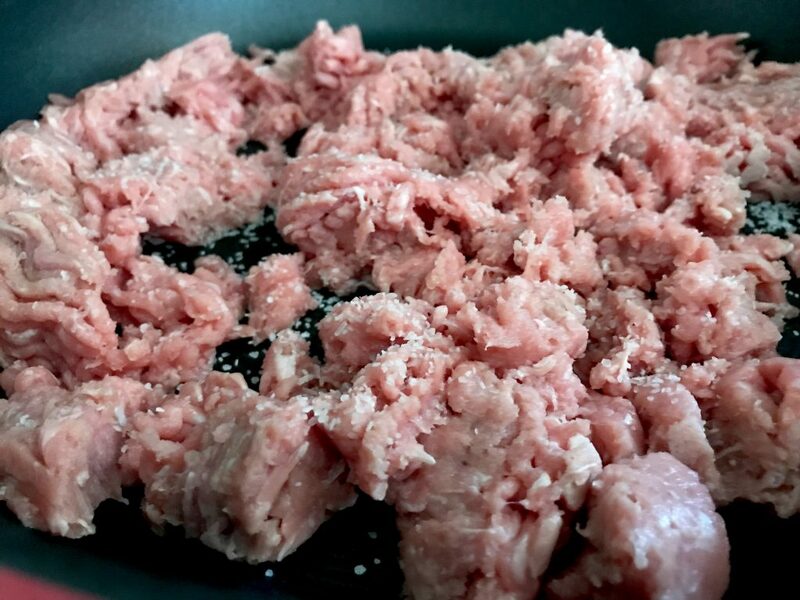 In a large skillet over medium-high heat add ground turkey, sprinkle kosher salt on, and break up with spatula. Add the chopped bell peppers, onions, and garlic to the ground turkey. Cook together until turkey is cooked through and vegetables are softened. Add diced tomatoes, pinto beans, tomato sauce, corn, Worcestershire sauce, oregano, cumin, chili powder, hot sauce, and salt. 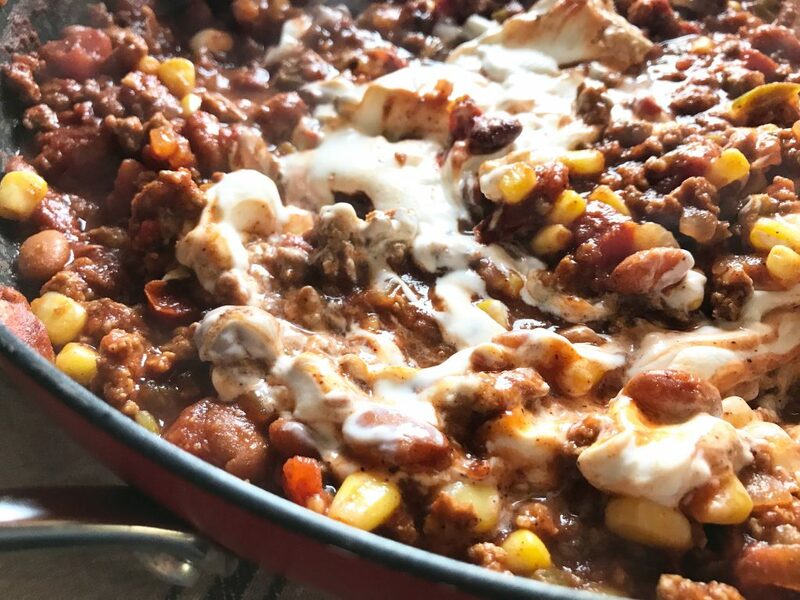 Stir the non fat greek yogurt into the chili. Bring to boil then return to low and cover. While the chili is simmering prepare spaghetti noodles according to package to directions. When the noodles are done, strain, and add to a lightly sprayed 9x13 casserole dish. 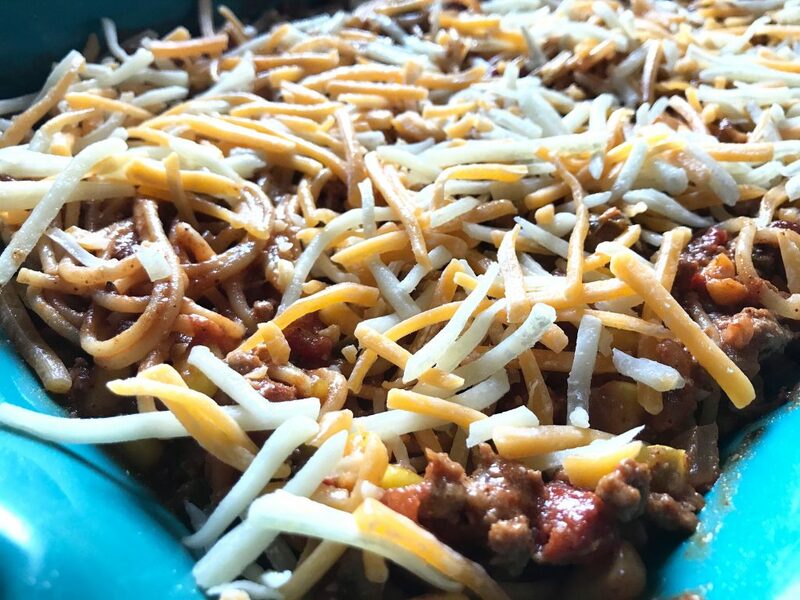 Layer the chili on top of the noodles and then sprinkle the cheese over the chili. Cover with tin foil and bake for about 30 minutes. Let sit for a minute or two before cutting into the bake so that it sets up. Enjoy! Outstanding! This was hubby approved and he can’t wait to eat it for lunch tomorrow. Thank you for all the great recipes. We love them! Made this tonight and my husband and I LOVED it!!! I’m looking forward to having more for my lunch again this week. So far it’s one of my favorites of your recipes! Thank you so much for all of your recipes! THANK YOU for keeping the regular smart points and not just the freestyle!! I haven’t decided if I was going to try the freestyle yet, but I want to keep going with being healthy! Your blog is AMAZING and helps me in getting healthy and feeling better, you are truly a blessing! What about subbing plain yogurt for sour cream since that is zero points. Would it effect the point any? 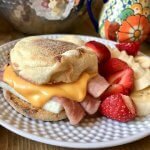 I love your recipes, keep them coming!!! Do you think this would freeze well for a make ahead meal? This was awesome — a winner with my husband too! 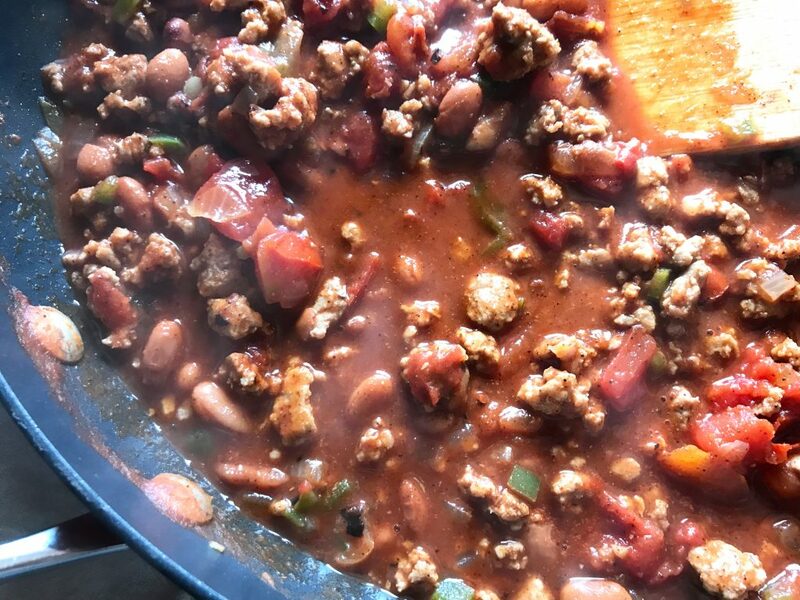 I did not have pinto beans so used Brooks Mild Chili Beans, but I had all the other ingredients on hand. In our area we have Steak n Shake restaurants that serve Chili Mac — way off the charts in WW pts – this makes a great replacement. This will be a staple on our menu! I shared this our local WW FB group too. Thanks! Just made this for dinner tonight and loved. My family gave it 7 out of 10. I have a lot of picky eaters, so that’s a pretty good rating in my house! This is my fourth recpe of yours that I’ve tried and they’ve all turned out to be delicious. 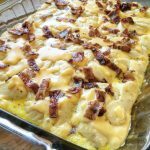 My boyfriend even approved of your biscuits and gravy bake, with the calorie slashed version. I now have new recipes to rotate through. 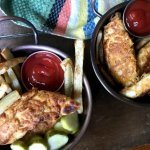 Thanks for coming up with great, healthy comfort food! 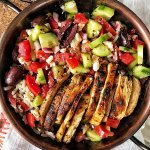 I made this for my weekly lunch meals last week and it was AMAZING!!! Truthfully, it has been the best thing I’ve eaten since being on the WW program. Thank you so much for sharing and for your recipes. I can’t wait to try more!!! What a compliment! 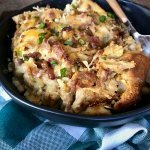 They are so many great WW recipes out there. Thank you so much for stopping by to tell me that and to rate it! I’m so happy you enjoyed. Let me know what else ya give a try! 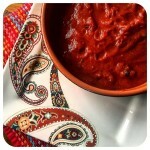 Sooo delicious, and quick and easy…and only 8 points.. genius!!! Thank you!!! You’re welcome! I am so happy you enjoyed! This is currently baking in the oven, can’t wait to taste it!! It smells delicious! Hey Star! You didn’t fail as a Mom. You tried, and realized she wasn’t ready instead of pushing her and that’s a win in my opinion! I also waited until my oldest son wanted to potty train and it went very smoothly. I plan to do it with my second as well. If that means he’s almost 3, that’s ok! We all do what’s best for our own kiddos:) I’m making this recipe tonight so I’m excited to try it! Awe, Thank you so much for your kind words, Amy!! I just realized now that you are a blogger!! (I’m sorry. I’m literally always late to the party!) I have to check it out ASAP. I am hoping when Pep shows a little more interest that it won’t be so hard. Looking back now I realize she was showing ZERO signs of being ready. OOPS! I hope you enjoyed the bake!! It’s been 17+ years since I potty trained, but with my son, it went beautifully once he was ready. He was 3, but once he decided to do it, it was easy. I think you have the right idea about waiting.